River Ave. Blues » Where does each 2018 Yankee hit the ball the hardest? Where does each 2018 Yankee hit the ball the hardest? Exit velocity is inescapable these days. Statcast puts the data at our fingertips and now you see it everywhere. On Twitter, on broadcasts, even on the scoreboard. The Yankee Stadium scoreboard showed exit velocity after balls in play this season. I’m not joking. It was right next to pitch velocity. We’ve known hitting the ball hard is a good thing basically since the dawn of baseball. Now we can measure it and that’s cool. Exit velocity is just one tool in the shed though. Launch angle and direction is important too. After all, the hardest hit baseball during the Statcast era is a 123.9 mph grounder that went for a 4-6-3 double play. True story. Stanton hit it two years ago. The best contact is hard contact in the air. Yes, a hard-hit grounder has a better chance to go for a base hit than a weakly hit grounder, but hit the ball hard in the air and good things will happen. On average, fly balls and line drives had a higher average exit velocity (92.1 vs. 82.5), batting average (.468 vs. .249), and isolated power (.454 vs. 022) than ground balls last season. Last season and every season. So with that in mind, let’s take a look at where each current member of the 2018 Yankees hit the ball the hardest last season. I don’t mean where he hits it on the field. I mean within the strike zone. Some guys can only put a charge into the ball when it’s middle-middle. Some guys are low ball hitters. Others can do damage on pitches pretty much anywhere. Those guys are the very best hitters in the game, the ones who can make great contact anywhere in the zone. For the purposes of this post, I’m going to consider a hard hit ball a fly ball or line drive with an exit velocity of at least 100 mph. Hitting the ball in the air is good, and 100 mph is a nice round number, so let’s go with that as our cutoff. Here’s where each 40-man roster member — not including Jake Cave, Thairo Estrada, Billy McKinney, and Gleyber Torres because they didn’t play in the big league last year — hit the ball the hardest last season. This post is image heavy, so everything is behind the jump. I’m listed the players in this post alphabetically, which is why we’re starting with Andujar. 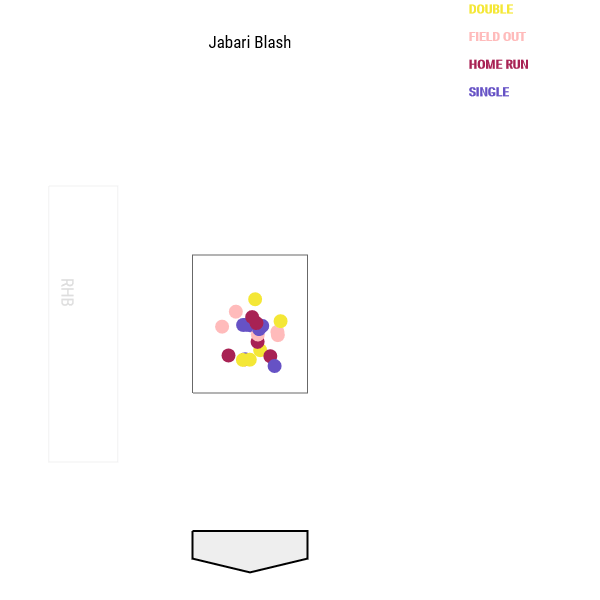 He was in the big leagues for about five minutes last season, and it amuses me that his two 100+ mph airballs came in two completely different locations. One was up and away, the other was down and in. Andujar has a weird profile. He’s a hacker who will swing at anything, though he also makes a lot of contact and has power. 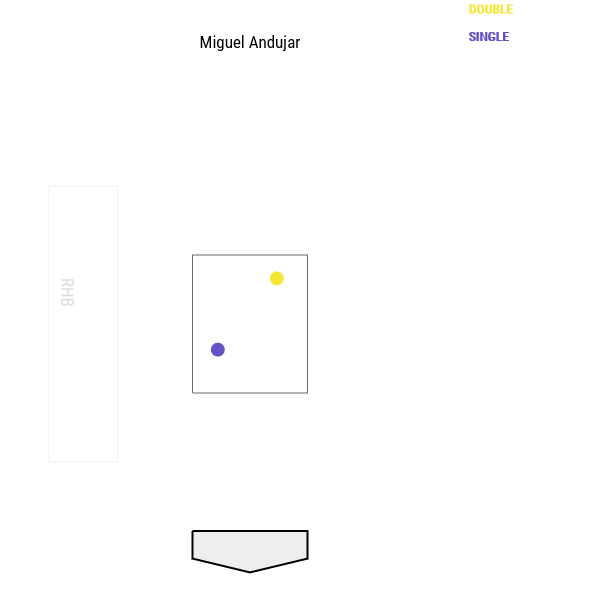 At some point last year Andujar saw a pitch high and away that he liked, so he hammered it. He also saw a pitch low and inside that he liked, so he hammered that too. The Miguel Andujar story. If nothing else, Austin has shown he can hit the ball pretty damn hard during his limited MLB cameos. He prefers the ball up in the zone rather than down, but generally speaking, out over the plate is his happy zone. 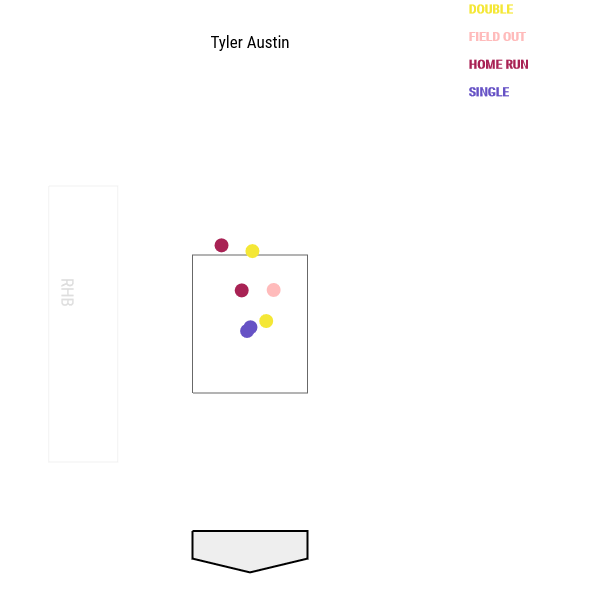 We haven’t really seen enough of Austin to know whether he can handle pitches down in the zone, or on the outside corner. Right now all we know is he can hammer a middle-middle pitch, and climb the ladder to get an elevated heater as well. Bird missed most of the season with the ankle injury and he still managed more 100+ mph fly balls and line drives than Jonathan Lucroy, Logan Forsythe, Josh Harrison, and many other players who played every day all season. Hitting the ball hard in the air is Bird’s thing. 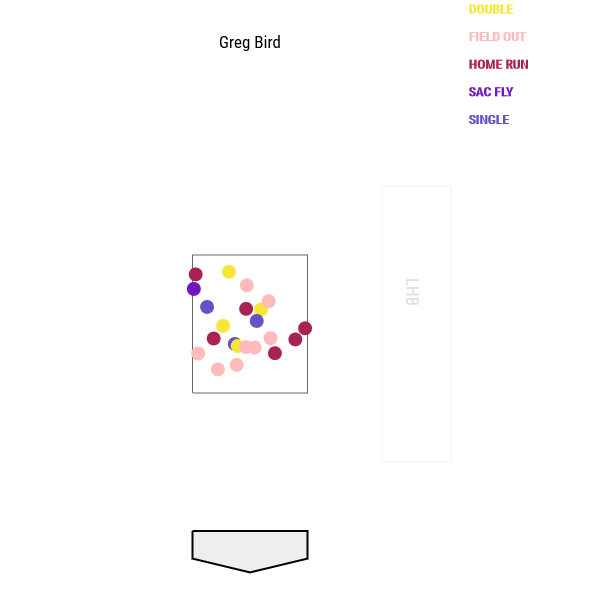 He hit homers on pitches in and out, and was able to drive the ball on pitches in the upper and lower halves of the zone. Now, that said, Bird’s average airball exit velocity and percentage of balls in play that were 100+ mph fly balls or line drives were down this season from his 2015 debut. They were 96.4 mph and 22.9% that year, so the rates were only down slightly, but down nonetheless. That makes sense considering how hobbled he was in April, before going on the disabled list. Even then, his 2017 rates were very strong. Bird can hit. That’s not the question. The question continues to be his ability to stay on the field. There’s no mystery here. Leave a pitch middle-middle and Blash will crush it. A pitch anywhere else? You can probably get away with it. The man with a career 35.8% strikeout rate in the big leagues and a 29.2% strikeout rate in Triple-A makes his living by punishing mistake pitches. Ain’t no shame in it. Ellsbury likes the ball down, eh? Anecdotally, that makes sense. Most of his home runs seem to come on pitches at the knees that he golfs out to right field, and don’t forget about all the catcher inteferences. 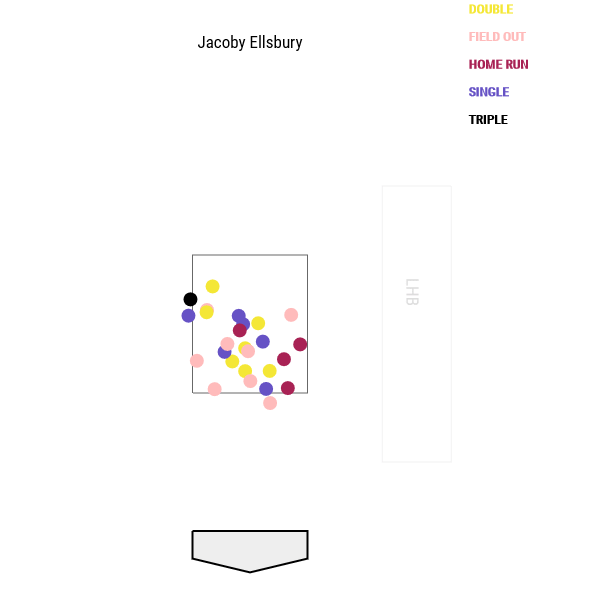 Ellsbury tends to chop down at the ball, which is why he hits the catcher’s mitt so often. His swing is conducive to hitting pitches down in the zone, and the strike zone plot shows that’s where he makes his best contact. At the knees. 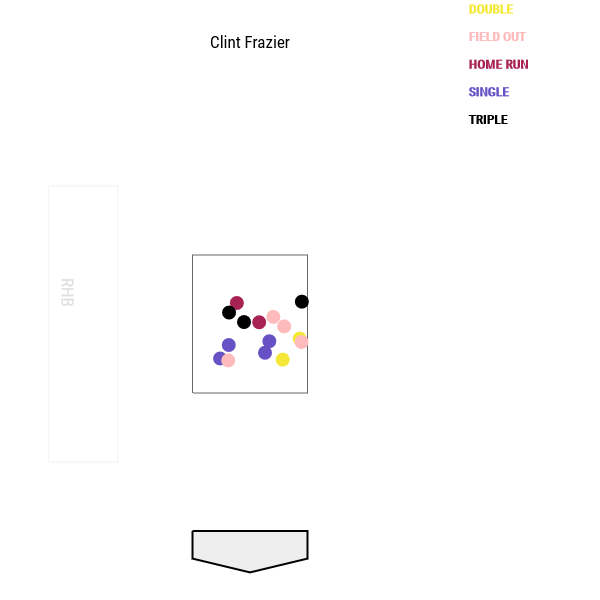 Fun Fact: Clint Frazier had exactly as many 100+ mph fly balls and line drives as Todd Frazier as a Yankee last season, but in 99 fewer plate appearances. Bat speed and exit velocity has never been a question with Clint. His hands are lightning fast. In his limited big league time last season, Frazier made his best contact on pitches out over the plate (duh) and in the lower half of the zone. He didn’t do much damage on pitches up in the zone, at least not based on the criteria used for this post. I suspect that with a full season’s worth of data, we’d see dots all over the strike zone. Clint strikes me as a guy who can get to anything and hit it hard. 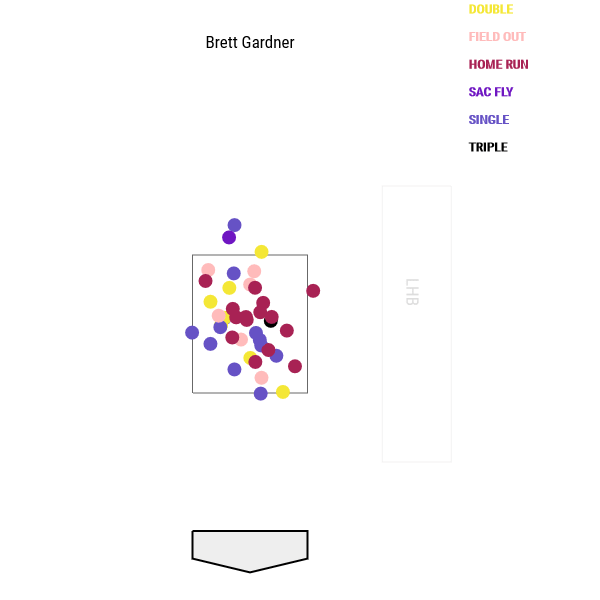 Two years ago Gardner’s average exit velocity on airballs was 89.8 mph, and 100+ mph fly balls and line drives accounted for only 6.1% of his balls in play. His exit velocity basically held steady last year, but his percentage of 100+ mph airballs ticked up a bit, so that’s cool. Gardner is a left-handed hitter who likes the ball out over the plate — who doesn’t? — though he has been known to tomahawk a high pitch up and out of the zone. He doesn’t do it often, but he does do it a few times a season. In 2016, Gregorius had an average exit velocity on fly balls and line drives of 88.7 mph, and 6.7% of his balls in play were a fly ball or line drive at 100+ mph. Basically the same as 2017. (In 2015, it was 88.0 mph and 5.0%, respectively.) Hmmm. I would’ve guessed Gregorius saw an uptick in both measures, but apparently not. Despite the same airball tendencies, Didi went from 20 homers in 597 plate appearances in 2016 to 25 homers in 570 plate appearances in 2017. Hooray for the juiced ball, I guess. You don’t need to hit a ball perfectly to hit it out now. Anyway, Gregorius has a pretty interesting strike zone plot. He gets most of his 100+ mph fly balls and live drives on pitches middle-away, but he can also turn on an inside pitch and pull it out of the ballpark. Corey Kluber learned that the hard way in Game Five of the ALDS (twice.) Also, most of Didi’s home runs on these batted balls were down in the zone. That makes sense to me. It seems Gregorius golfs most of his homers. Hicksie is the only switch-hitter on the 40-man roster, and interestingly enough, the two strike zone plots are similar. His 100+ mph fly balls and line drives came mostly on pitches middle-away. He didn’t turn on any inside pitches. 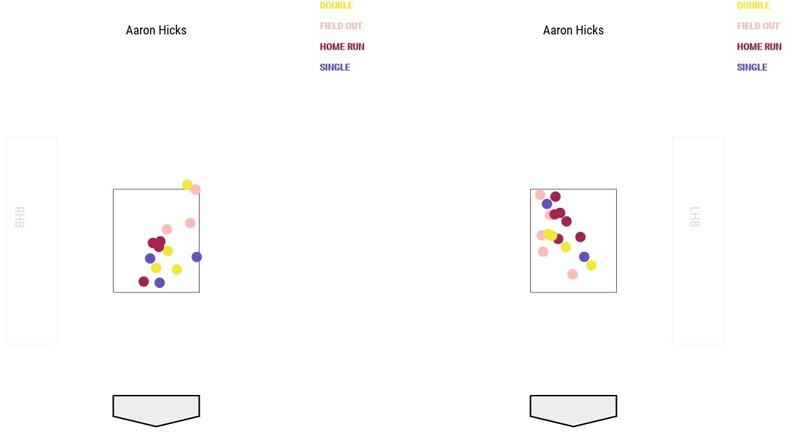 That said, the 100+ mph airballs that went for home runs came on pitches in the lower half of the strike zone when Hicks was batting righty, and in the top half of the zone when he was batting lefty. Huh. Switch-hitters fascinate me. It’s so hard to be successful from one side of the plate in this game. These guys manage to do it from both sides. One hitter, two swings, two different sets of tendencies at the plate. 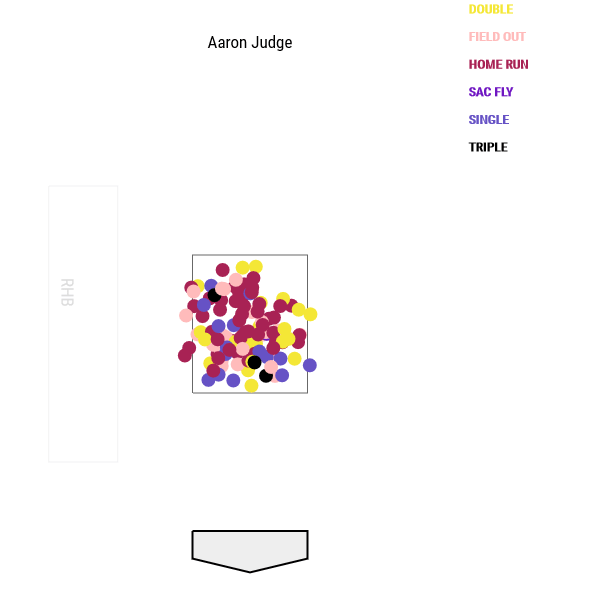 Based on the strike zone plot, the entire strike zone is Judge’s wheelhouse. He crushed pitches down, pitches up, pitches in, pitches out, and of course pitches down the middle. That is crazy impressive for a guy his size. Judge will swing-and-miss, we all know that. Look at that strike zone plot though. Where are you supposed to pitch the guy? He showed this year he’s capable of hammering anything in any part of the strike zone. Yes, Romine hit some balls hard this season, hardy har har. Mostly middle-middle is his wheelhouse, though he did go down and get a few pitches, and also do some damage on pitches middle-away, when he could really get his arms extended. 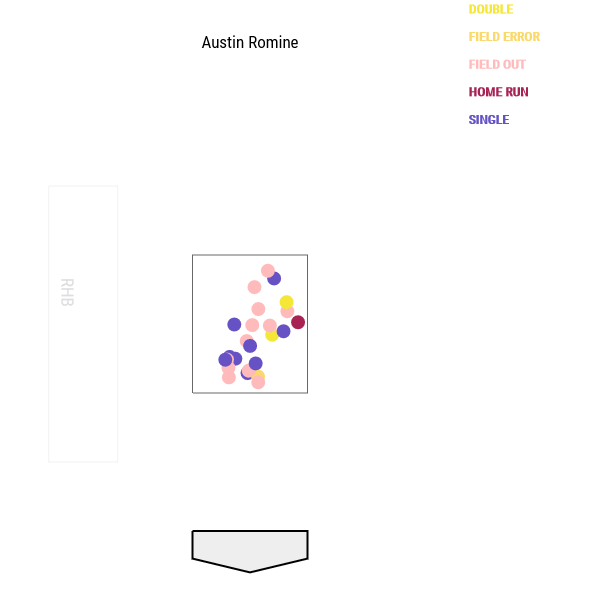 Romine is not a great hitter — or even a good hitter, for that matter — but he is evidence that most players at this level are capable of making a pitcher pay for a mistake pitch out over the plate. Similar to Judge, Sanchez has a great big wheelhouse. He can go up or down, in or out, and you definitely do not want to give him anything middle-middle. 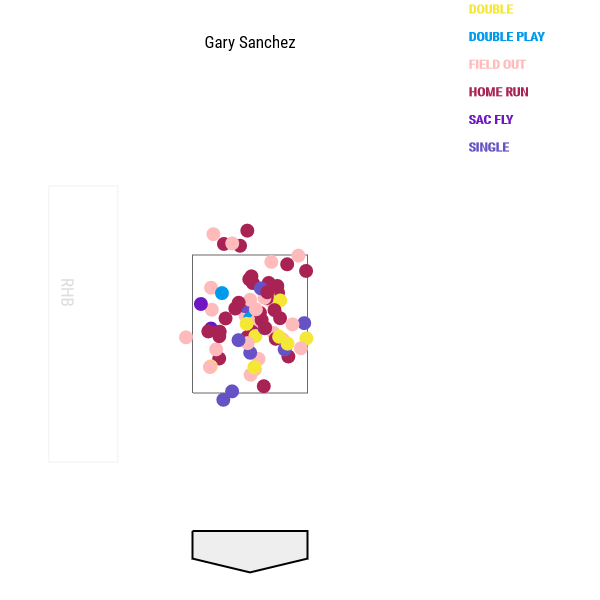 Gary hit most of his home runs on pitches in the top half of the strike zone last season, even going above the strike zone to tomahawk three pitches over the wall. There is a controlled aggression to Sanchez’s game. He’ll take his walks (7.6%) and his swing rate on pitches out of the zone (36.3%) isn’t crazy high, yet Gary will go after just about anything in the zone, and chances are he’s going to hit it hard. Interesting plot! Stanton makes his best contact on pitches in the lower two-thirds of the strike zone. He did go above the zone to tomahawk two home runs last year, but those are outliers. The bulk of his 100+ mph fly balls and line drives are in the middle third of the zone and below. 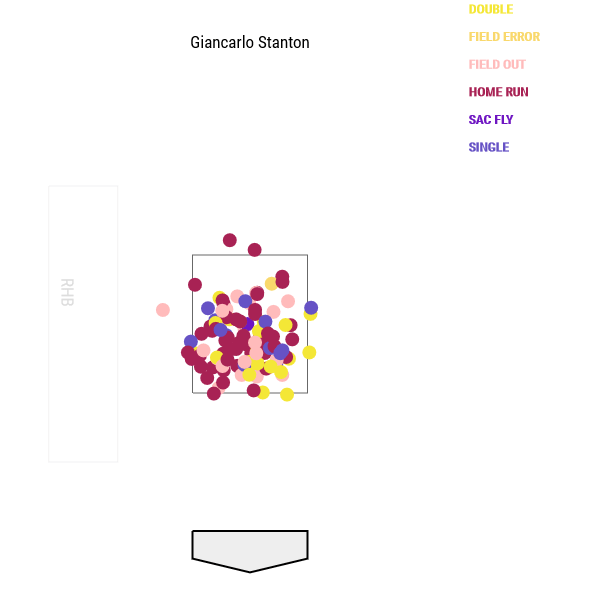 Stanton’s a big dude, and he’s at his best when he reaches down to get the ball, and golfs it. That doesn’t necessarily mean Giancarlo has a hole upstairs. It just means he’s most dangerous on pitches belt high and below. 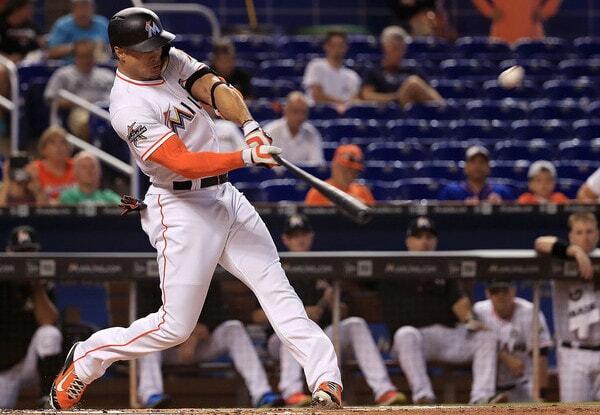 Stanton’s a great hitter. His plot makes Judge’s look that much more impressive. As I mentioned in the Judge section, Torreyes did not hit a single ball in the air with an exit velocity of at least 100 mph last season. Didn’t do it even once. Heck, he didn’t even hit any ground balls at 100+ mph. He did come close though. The hardest Torreyes hit a ball last season was 99.6 mph, which he did twice. One was a ground out against Dan Jennings, and the other was a homer against Jake Odorizzi. So, to generate a plot for Torreyes, I dropped out exit velocity minimum to 95 mph. 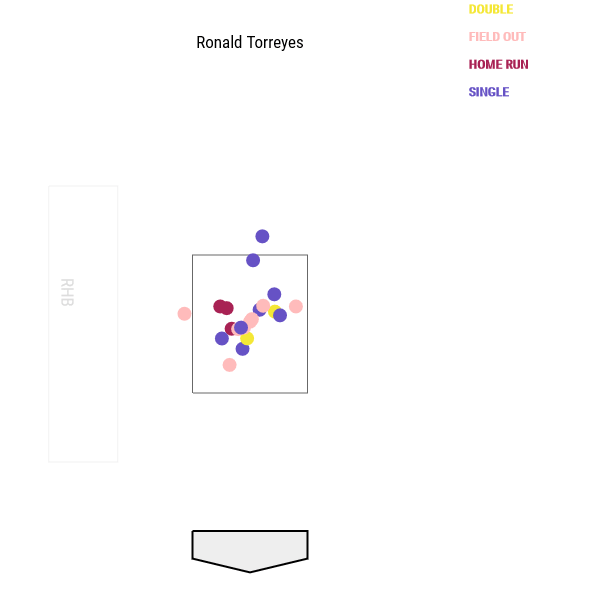 A pitcher basically has to lay it right in there for Torreyes to hit a ball that hard. I don’t mean to pick on Toe. This really isn’t his game. He’s more about making contact and hitting it where they ain’t. Not driving the ball with authority. He is the ying to Judge’s (and Stanton’s) yang. Heh. 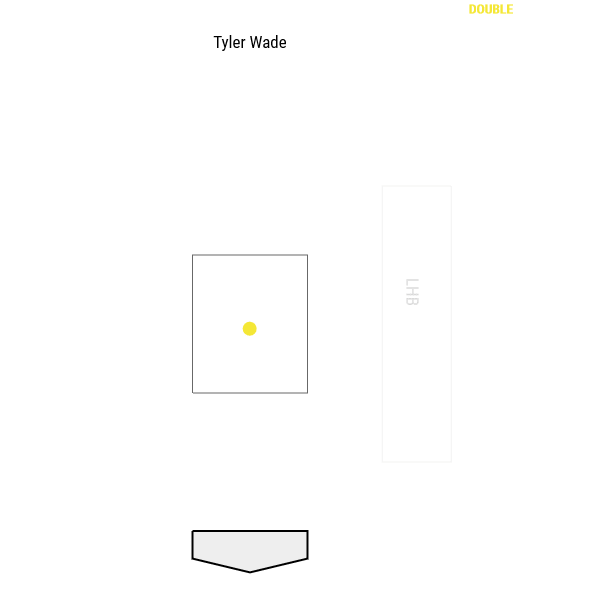 The players in this post are listed alphabetically, but it is fitting we close with Wade, who hit one ball in the air at 100+ mph during his relatively brief big league time last season. And it came on a pitch right down the middle. I like Wade. Have for a while. I’m hoping he gets to play quite a bit next season and we can look at a more detailed strike zone plot when I do this again next year.